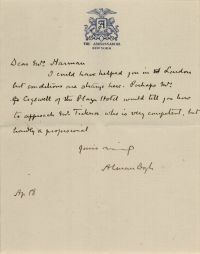 This letter was written by Arthur Conan Doyle on 18 april 1922 from The Ambassador hotel, New York, to Mrs. Harman, 601 West 116th Street, New York. 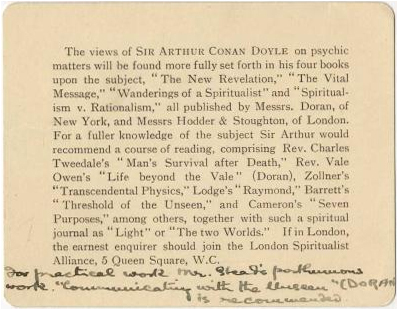 Enclosed was an additional card with two lines handwritten by Conan Doyle (see below). I could have helped you in London but conditions are strange here. Perhaps Mrs. Cogswell of the Plaza Hotel would tell you how to approach Mr. Ticknor who is very competent, but hardly a professional. This page was last edited on 20 March 2019, at 10:19.